Josh Fox could teach Corporate Welfare 101. His non-profit Sweet Jane Productions, Inc. plays government agencies and tax-exempt special interest foundations as suckers. Josh Fox loves to rail against corporations. If several quotation websites can be believed, he said “I think we’re in an era of unprecedented dominance by corporations. I think people understand that deeply; I don’t think that’s even questioned.” Nonetheless, his angst regarding corporations appears to be a fleeting thing because he uses one routinely in his day to day work of trashing America and the gas industry. He has, in addition, at least two limited liability companies (LLCs). His corporation, Sweet Jane Productions, Inc., is also a corporate welfare queen. That may be it’s public purpose, but it’s private purpose appears to have been to collect as much corporate welfare as Josh Fox could garnish to operate his very strange theatre company, which produced stuff like this before Gasland. He’s been very successful in feeding at the public trough. To support International WOW’s “The Recovery Project,” an interactive and participatory drama about home construction and the building boom. 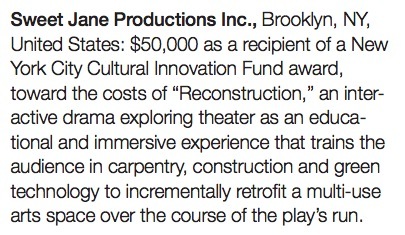 Over the course of the performance run, audiences will be trained in carpentry, construction, and green technology to modify an existing structure in an effort to investigate what constitutes a home and how inappropriate development has contributed to foreclosures, unfinished buildings, and limited viable community spaces. To support a production of “Auto Da Fe,” a new work created by International WOW in collaboration with playwright Matsuda Masakata. The play is a reinterpretation of the Odysseus myth and was originally produced in Kyoto, Japan to great popular and critical acclaim. To support the production of “You Belong to Me,” a chamber piece conceived and directed by Josh Fox. The piece will be co-created by an international ensemble of artists from Argentina, Palestine, Japan, and the United States. To support a consortium project with Soho Think Tank to produce the world premiere of “Will We Not Return.” Conceived and directed by Josh Fox, the piece will be created collaboratively by an international ensemble and will feature the company’s founding members from Thailand. To support the development and production of a new theater work entitled Death of Nations. Guest artists from Argentina, Japan, and Thailand will collaborate with the company ensemble in the development and presentation of the play. The New York artists of the International WOW Company are continuing to spearhead the creation of a new work entitled Death of Nations. The project will involve emerging and established artists from WOW’s New York and Thai companies as well as artists in Japan and Argentina. Artistic Director Josh Fox, Associate Artistic Director Aya Ogawa, and the ensemble have and will continue to travel to each of these countries for intensive rehearsals and work-in-progress performances with local artists, these workshops will create the four “chapters” of Death of Nations. In Argentina WOW Core member Dario Tangelson will serve as liaison and lead artist, for the Japanese chapter we have an established relationship with Japanese ensemble M-Laboratory under the direction of Hiroyuki Miura and also with the Setagaya Public Theater in Tokyo. The International WOW Company calls both Thailand and New York home, our Core members on each continent serve as the ensemble under Josh Fox and Aya Ogawa. This is part of a very long speech Fox says “should be delivered directly to the audience with no pauses, very rapidly and passionately” by “a white man dressed as a politician.” Yes, this is what Fox does with the unique form of corporate welfare he gets from the New York State Council on the Arts. Are you happy yet, New Yorkers, with how your tax money is being spent? Well, there’s more. Josh Fox has also taken money from the Brooklyn Arts Council, which in turn takes money from the National Endowment for the Arts and the New York State Council on the Arts, to upgrade his rehearsal space. The piece explores two questions: Is a sustaining love possible between people; and is a sustaining peace possible between nations? By juxtaposing these issues, A History of God aims to address the role of “projection” in contemporary culture – in the drive to war, in which nations project images of otherness onto a dehumanized enemy; in the formation of identity, in which the literal projection of media images informs our definition of self; and in the process of falling in love, in which we create a fantasy of the beloved from our desires and needs. This inquiry has led to a final obsession: Is it possible to see the person before you as real? A History of God grafts the war-zones of Iraq and Afghanistan onto our American present. The space created is simultaneously an interrogation room, an office and a brothel in which Americans can pay to enact their fantasies on a Third World other. Love is war, war is business, and identities can be exchanged as commerce. Gender is a continuum; characters switch back and forth as easily as changing their clothes. During Reconstruction, the audience will assist in the greening, or transforming, of a raw space into a renewable energy performance space that will serve as an artistic hub, a community center, and a model for utilizing renewable energy and technology to reclaim public spaces. In collaboration with noted urban-planning expert and MacArthur “Genius Grant” award recipient, Majora Carter, we will be transforming the former Spofford Detention Center in the Bronx, which is now an abandoned, unused Juvenile facility. In the winter of 2013, WOW will begin the process of transforming the space through the use of renewable energy technology, such as solar panels, wind turbines, geothermal energy, and others.WOW is also partnering with Eastern Energy Systems, Long Island’s leading renewable energy company, to create the building’s energy systems. 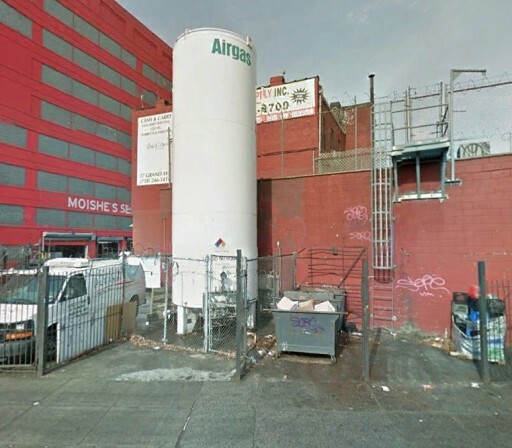 Architect Joe Levine, an expert in retrofitting and restoration, will lead the effort. In part one of the play, the audience will start out incarcerated in the many still-standing jail cells at Spofford. In part two, they will be processed and trained in green retrofitting as they emerge from the prison system into a sustainable society. In part three, using teleprompters, selected audience members will serve as characters performing with members of the ensemble in the unfolding drama, telling the stories of those who were real, former inmates at Spofford. Sounds like great fun, doesn’t it? We could go on, as there are still other examples, but what is clear is that Josh Fox is a huckster preying upon governmental agencies and wealthy tax-exempt foundations to do his art, such as it is. His latest 990 return indicates Sweet Jane Productions, Inc. took in $515,875 in gifts, grants, contributions and membership fees in the last five years and only $528,712 in gross receipts from admissions, sale of merchandise and the like. We also know Sweet Jane Productions, Inc. set up wholly owned LLCs for both Gasland and Gasland II, with separate budgets and, probably, separate funding sources. The whole enterprise provides a convenient method of grabbing money from the government and tax-exempt entities, making Sweet Jane Productions, Inc. a corporate welfare queen. The non-profit status of the corporation gives it the ability to operate free of the constraints of the entertainment market and deliver products tailored to the wants of Josh Fox himself and, in the gas of Gasland, the special interests he represents. It’s Corporate Welfare 101, in fact. If only his cult members would wake up and realize their following the Pied Piper to his vault only to have the door slammed in their faces after he enters into the cause of a new domain. I hope when he did his film on home reconstruction he did a segment on installing a forced air natural gas heating system, since the vast majority of homes use natural gas for heating. He accepts money from the Doris Duke Foundation: does Josh know the source of the foundation’s wealth? Tobacco! Where’s his moral high-ground about impacts on human health and carcinogens? Didn’t know that – amazing. Nice picture of Josh and his Delaware Riverkeeper gang in their natural surroundings. Environmentalists my arse! Show us the farms and stop the joshing.